Bert Tanner works in the general field of planning and control of robotic systems, with emphasis to multi-agent coordination. Specific areas include hybrid dynamical systems, mobile manipulation, nonholonomic motion planning and control, and mobile sensor networks. Bert Tanner earned his PhD in mechanical engineering from the National Technical University of Athens (NTUA) in Greece, in 2001. He went on to the University of Pennsylvania, where he spent two years as a post-doctoral researcher. From 2003 to 2005 he was an assistant professor at the University of New Mexico. In 2008, he joined the department of Mechanical Engineering at the University of Delaware. 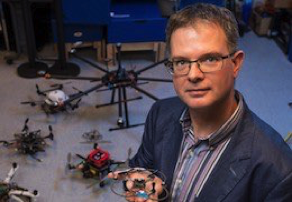 He was awarded the NSF Career award in robotics in 2005, was elected a senior member of IEEE in 2008, and became an ASME fellow in 2018.